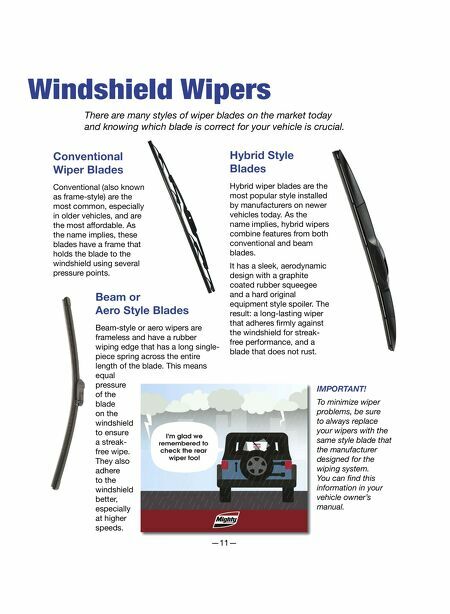 —11— our Windshield Wipers There are many styles of wiper blades on the market today and knowing which blade is correct for your vehicle is crucial. Conventional (also known as frame-style) are the most common, especially in older vehicles, and are the most affordable. As the name implies, these blades have a frame that holds the blade to the windshield using several pressure points. Beam-style or aero wipers are frameless and have a rubber wiping edge that has a long single- piece spring across the entire length of the blade. This means equal pressure of the blade on the windshield to ensure a streak- free wipe. They also adhere to the windshield better, especially at higher speeds. Hybrid wiper blades are the most popular style installed by manufacturers on newer vehicles today. As the name implies, hybrid wipers combine features from both conventional and beam blades. It has a sleek, aerodynamic design with a graphite coated rubber squeegee and a hard original equipment style spoiler. The result: a long-lasting wiper that adheres fi rmly against the windshield for streak- free performance, and a blade that does not rust. Conventional Wiper Blades Beam or Aero Style Blades Hybrid Style Blades IMPORTANT! 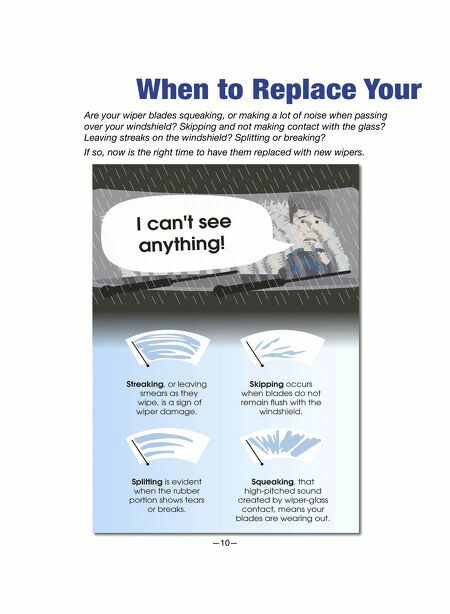 To minimize wiper problems, be sure to always replace your wipers with the same style blade that the manufacturer designed for the wiping system. You can fi nd this information in your vehicle owner's manual.